1 Wall Street, at the southern corner of Broadway, has long been a prized address. In 1905, the 30' by 40' lot that had been occupied since the early 19th century by a four-story commercial building changed hands for the highest price per square foot ever recorded for Manhattan property: $615. The new owners, businessmen from St. Louis, erected a very plain 18-story tower on the site, multiplying the space (and rents) nearly five times. The so-called "Chimney Building" squeezed two offices per floor onto the 1,200 sq. ft. parcel (an area about one quarter the size of this museum). In 1928, the powerful interests of the Irving Trust Company purchased 1 Wall Street and the neighboring buildings to the corner of New Street. The new site was still narrow, only 77' on Wall Street, but stretched along Broadway for 178'. Consuming the full block frontage meant that the new building could rise with windows on all sides. The new 50-story skyscraper began construction in 1929: progress photographs on the exterior of this case show the foundation construction in the fall of 1929. The tower design by Ralph Walker of the architectural firm of Voorhees, Gmelin & Walker is an Art Deco masterwork. The expensive limestone fa�ade was sculpted in an unusual curtain-like surface that softened the play of light and shadow. On the ground floor, a grand banking hall, the famous "Red Room," was faced in red and gold mosaics with a theatrical effect. The bank leased the 11th through 45th floors, but kept the top stories for executive offices and a lavish boardroom. The magnificent rendering by the delineator Chester B. Price displayed here conveys the monumental dignity of the building as seen from Broadway, across the cemetery of Trinity Church. A series of photographs on the opposite side of this case documents the three successive buildings at 1 Wall Street. 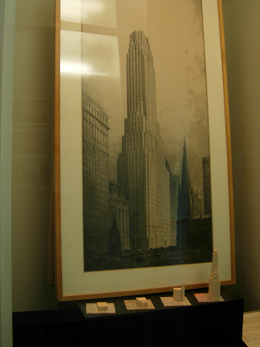 Left to Right: Irving Underhill; 1902, 1929, 1931; Collection of The Skyscraper Museum. 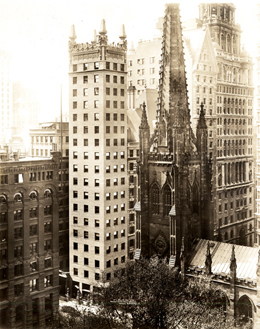 Three photographs of 1902, 1929, and 1931 capture the views across Trinity Church cemetery and the corner of Broadway and Wall Street, revealilng the successive buildings that occupied the address 1 Wall Street. The Chimney Building, Irving Underhill, 1907. The four-story building that occupied the site from the mid-19th century was demolished in 1905 for the 18-story "Chimney Building." A holdout property that long resisted development, the slender building was sold in 1929 to the Irving Trust Company for the highest price per sq. ft. price recorded to date. Irving Trust also purchased the neighboring properties, demolishing them all in 1929 and replacing the full-block with the Art Deco tower by Ralph Walker pictured in the rendering displayed in this case. 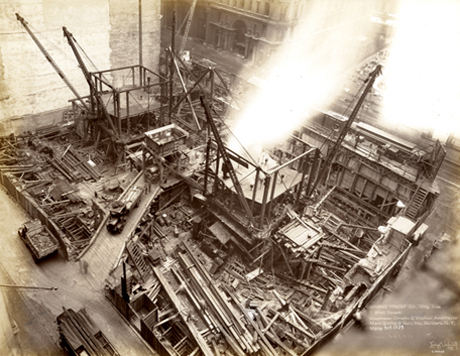 These progress photographs of the construction of the Irving Trust Co. Bank Building were commissioned by the foundation engineers Spencer, White & Prentis to document their work. In the top photograph, the rear of the New York Stock Exchange and Annex are visible across the excavated site. Below, a street-level view shows the impact of the work on Wall Street, with Trinity Church in the background. All photographs on loan from Mueser Rutledge Consulting Engineers, the successor firm of Spencer, White & Prentis.